, dat in 2018 werd opgericht na het succes van het DNI in Europa. News agency content is used widely and is often edited or used as a source material making it difficult to track or find. Innovative matching algorithms will make it clearer where the content originated. Just finding is not enough though, agencies also often lack a clear picture of how that content performs. This tool combines various techniques to offer a real-time dashboard and historical reporting engine on content performance. Traditionally, the Dutch market for paper leaflets is very big, with hundreds of different leaflets being delivered in the offline mailbox of almost every household. Recently, new environmental rulings limit the distribution of paper leaflets. Retailers still want to reach (potential) store visitors and we want to provide them this opportunity. NU.nl wants to gather these existing offers and apply machine learning to recognise individual offers, text, images and other characteristics. After matching these unbundled offers (and the location of shops) with our user profiles, we can show our 7.5 million users relevant, localised information (offers) around local news. Business models are still very much a challenge for media and podcasting is no exception. Most of the shows rely on advertising. The reason advertisers like podcast is because the audience truly cherishes its favourite shows. The strong connection between the listeners and the show is fundamental to podcasting culture. Advertising works remarkably well because of that reason, but it's also very risky if a media industry relies completely on advertising revenues. The Podcast Loyalty Program wants to generate a new source of income: one directly from the listeners to the shows. Meanwhile, the program strives to strengthen and broaden the special bond." The direct monetary value of a digital photograph is approaching 0.0. The shift to online news consumption has put the craft and mission of photojournalism at existential risk, surviving for now on dwindling print-side budgets and NGO and corporate clients. Photojournalism urgently needs new business models that reconnect it with the digital news industry and creates real revenue for both. Deepfakes present unprecedented risks for businesses and governments, including sophisticated kinds of fraud, identity theft and fake news. Deeptrace provides a detection API that scans videos for malicious alterations, akin to antivirus software. Language bubbles in Europe have been a barrier that has blocked the development of a pan-European platform that covers news from different countries. There wasn’t enough willingness to pay for digital news to make such effort feasible. That has changed since the rise of fake news. Journalists from all European countries can publish their content on MindTheFacts.com to reach an international paying audience. All content must be produced by the principles of the Conduct of Journalism as truth-finding as that is the most important value in modern day journalism and one of the most important things consumers are willing to pay for. Een loyaliteitsprogramma voor podcasts, een tool om de herkomst van nieuwsberichten te achterhalen, een API om deepfakes mee te detecteren en een nieuwe manier om lokaal nieuws te koppelen aan lokale advertenties. Een totaal van zes Nederlandse, innovatieve ideeën om de journalistiek naar een hoger plan te tillen krijgt opnieuw steun uit het innovatiefonds van Google's Digital News Initiative. Voor deze zesde (en laatste) financieringsronde ontvingen we ruim 600 aanmeldingen, uit heel Europa waarvan er 103 steun krijgen. Zes initiatieven komen dus van Nederlandse partijen: ANP, NU.nl, Noor Images en drie startups. Zij ontvangen een totaal van anderhalf miljoen euro, wat ronde zes tot de succesvolste ronde voor Nederland maakt. Zie verderop voor omschrijvingen van hun projecten. Google startte het Digital News Initiative (DNI) in 2015, met daaraan gekoppeld een fonds van 150 miljoen euro voor Europese initiatieven die de journalistiek verbeteren met behulp van technologie. Nu ronde zes voorbij is en Google met zo'n 150 miljoen euro heeft bijgedragen aan Europese, digitale nieuwsinitiatieven, komt er een einde aan het Innovation Fund. De afgelopen drie jaar zijn er meer dan 5.000 ideeën ingediend. 662 daarvan uit 30 Europese landen hebben steun ontvangen van het DNI. 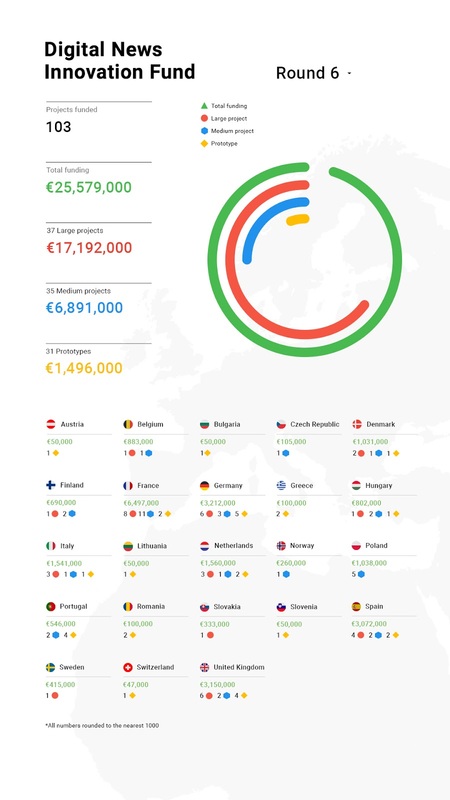 Google steunde 29 Nederlandse initiatieven met een totaal van 5,5 miljoen euro. Winnende initiatieven kwamen onder meer van de Volkskrant, RTL Nieuws, VPRO, NRC, Follow the Money, BNR Nieuwsradio, Blendle, NU.nl en ANP. Het Digital News Initiative gaat op in het wereldwijde Google News Initiative, dat in 2018 werd opgericht na het succes van het DNI in Europa.